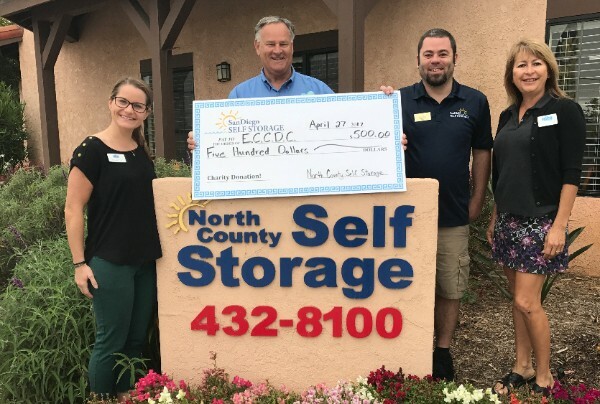 Escondido Community Child Development Center (staff pictured above at North County Self Storage) is a non-profit preschool for children ages 4 months to kindergarten. They provide services in support of families working, looking for work or for parents pursuing a higher education. All applicants are from low-income homes in the Escondido area. They serve over 300 children at two Child Development Centers in the Escondido area. The child development program includes a full range of education, health and social services designed to assist children and their families to maximize their full learning potential. They also have on-site health screenings, including vision, dental health and more. Each child is served two main meals and two snacks per day. This charity means a lot to the team at North County Self Storage. Our staff empathizes with the struggle many of us face to raise children while working or getting a higher education. Our Facility Manager, Cody Blew, said of the donation, "It shows the children that you can accomplish anything you put your mind to and that there is someone out there who can help."